Fried Oyster Mushrooms is my vegan version of fried clams or oysters. I use organic cornflake cereal crumbs for the breading because the light cereal sweetness mimics the sweetness of fried clams and oysters. Regular fine breadcrumbs will work too. Fresh oyster mushrooms are often difficult to locate and when they are available, they’re rather expensive. However, canned oyster mushrooms can be purchased from your local Asian market and are very inexpensive. They also have the perfect texture for this recipe. Canned abalone mushrooms work well too. Serve with vegan tartar sauce or cocktail sauce. Here I’ve served them with a vegan fire-roasted jalapeno and lime tartar sauce (recipe follows). To make cornflake crumbs, place the cornflakes in a zip-lack or paper bag, seal and crush with your hands. They can also be crushed in a food processor. If using canned mushrooms, drain the water. Remove any tough portion of the mushroom stems and slice the mushrooms into strips. Place the mushroom strips into a zip-lock bag and add the flour. Seal and shake well to coat the mushrooms. In a small dish, mix together the milk and mayo until smooth and pour into the zip-lock bag. Add a few pinches of salt, seal the bag and shake until the mushrooms are coated. 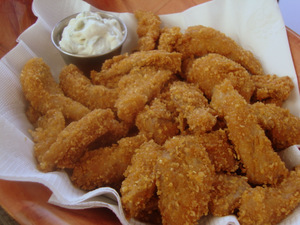 Add the cornflake crumbs or the breadcrumbs to a bowl and dredge the mushroom strips in the crumbs until well-coated. In a deep wok or skillet, heat about 1/2-inch of oil over medium-high heat until the oil begins to shimmer. Fry the mushrooms until golden – they cook quickly, about 30 to 45 seconds, so watch them carefully. Remove with a slotted spoon and drain on a plate lined with paper towels. Serve hot with the condiment of your choice for dipping. Place the jalapeno directly on the stove burner over medium heat. Turn frequently with tongs until the pepper is blistered and blackened. Place the pepper in small zip-lock or paper bag and seal to hold in the steam. Let cool. The skin should slip off easily. Cut off the stem end, split the jalapeno lengthwise and remove the seeds. Finely mince and add to a small bowl. Add the mayo, onion, the lime zest and a squeeze of lime juice. Mix well and season with salt to taste. Refrigerate to blend flavors and until ready to serve. 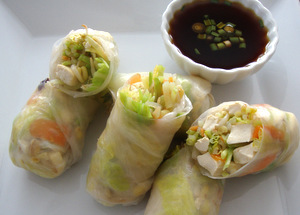 Just about any filling can be used for Spring rolls. Raw, steamed or lightly sautéed vegetables should be coarsely chopped or sliced into thin slivers. Fresh herbs are wonderful to use in Spring rolls as well. Try my Soy Ginger Dipping Sauce (recipe follows) for dipping your rolls. Prepare your filling and set aside. Fill a dinner plate with hot water and set next to your work surface. Submerge a wrapper in the water on the plate. Count to ten and remove the wrapper. It may not feel totally pliable at this point but it will be by the time you wrap your filling. Hold the wrapper by the edge over the plate so the excess water can drain. Gently place the wrapper on your work surface. Place a few tablespoons of filling in the center of the wrapper, avoiding about 2-inches on each side. Fold the wrapper in half over the filling. With your fingers, press down to compress the filling. Fold the sides in (like a burrito) and then roll up as tightly as you can. This technique takes a little practice so be patient. Repeat until the filling is used up. If you have a hard time wrapping, try doubling the wrappers. Slice the rolls with a sharp knife on the diagonal. Serve with your favorite dipping sauce. Combine the sugar, soy sauce, and water in a small saucepan. Bring to a boil. Stir in the cornstarch/water paste. Reduce heat to a simmer and add the garlic, ginger, lime juice and green onions. Continue to simmer, stirring frequently, for about 2 minutes to blend the flavors. Chill until ready to serve. 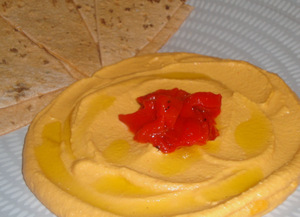 Hummus is a classic Middle Eastern dish and is excellent served as an appetizer or sandwich spread. Sweet roasted red peppers add a wonderful flavor to this variation. • garnish with a drizzle of olive oil and chopped roasted red peppers. The hummus may seem a bit thin after processing, but keep in mind that because it contains olive oil (which hardens when chilled) it will thicken upon refrigeration; if it becomes too thick after refrigeration, simply incorporate a little water. Giardiniera (pronounced jar-dih-nair-ah) is an Italian-Amercian condiment of pickled vegetables. Commercial giardiniera is a bit too “vinegary” for my taste, so I created my own blend which is nicely pickled and seasoned but not over-powering. The vegetables are wonderful served “as is” or they can be drizzled with olive oil just before serving. 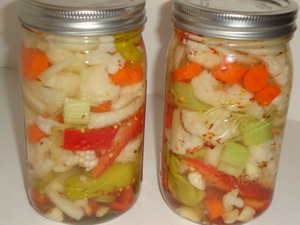 Allow a minimum of 1 week for sufficient pickling. You will also need 2 large mason jars (home canning jars) with lids and lid rings (or other suitable glass containers with lids). Place 1 bay leaf, 3 cloves chopped garlic, ½ teaspoon dried oregano and ½ teaspoon red pepper flakes in the bottom of each jar. Set aside. Prepare the brine by mixing the water, vinegar, salt and sugar in a non-metal container. Stir with a plastic or wooden spoon until the salt and sugar dissolves. Set aside. Bring 4 cups of water to a boil in a pot and blanch the carrots and cauliflower for 1 minute. Drain in a colander. Divide the vegetables in half (approximately) and begin layering and gently packing them into the 2 jars. Pour in the brine to the top of each jar and seal with the lids. Refrigerate for a minimum of 1 week (the longer, the better), turning the jars over occasionally to distribute the seasonings. Serve with a drizzle of olive oil and coarse ground black pepper, if desired. A very simple yet elegant way to serve artichoke hearts as an appetizer. In a small saucepan over medium heat, warm the olive oil. Add the butter or margarine and stir until melted. Add the garlic and oregano and sauté for 1 minute. Whisk in the starch until smooth and then whisk in the wine. Add the red pepper flakes and salt. Bring to a simmer, stirring frequently, for about 2 minutes, and then remove from the heat. 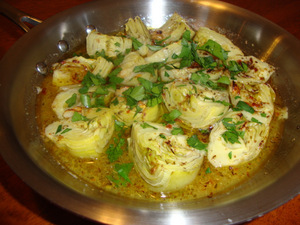 In a small heatproof chafing dish or skillet, arrange the halved artichoke hearts. Pour the sauce over and place under the broiler to heat through, about 5 to 6 minutes. Garnish with chopped parsley and additional red pepper flakes if desired. Serve with a crusty Italian bread to soak up the extra sauce. Latkes, or potato pancakes, are commonly associated with traditional cuisines of Germany, Austria and Eastern Europe. The term “latkes” is Yiddish in origin. Most traditional recipes call for freshly grated potatoes and are mixed with egg and flour to bind them. I experimented with the freshly grated potatoes and found the pancakes to be very gummy, even after rinsing away and squeezing out the excess starch. So, I opted for canned new potatoes, which are already cooked until tender. They seem to work amazingly well for creating a light and crispy pancake. Of course you can always peel and boil a pound of fresh new potatoes just until tender, if you prefer. 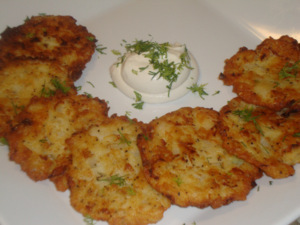 This recipe is gluten free and yields about 8 to 10 latkes. • garnish of your choice, such as applesauce, sour cream, chopped herbs, etc. Drain the water from the potatoes. Blot them on a paper towel and then coarsely grate them on a standard cheese/vegetable grater. Place the shreds in a large bowl. Add the remaining ingredients, mix thoroughly and let the mixture sit for 15 minutes. Form the potato mixture into golf size balls and set on a work surface. Heat the oil in the skillet over medium-high heat until the oil begins to shimmer. In the palm of your hand, flatten a potato ball with your other hand and shape into a patty. Gently place the patty in the hot oil and repeat with the other potato balls. Don’t crowd the skillet; fry them in 2 batches of 4 at a time until golden brown and crispy, about 3 to 5 minutes per side. Handle them carefully – remember, there is no egg to bind them, so they are a bit more delicate. Remove them with a slotted spoon and transfer to a plate lined with paper towels to drain. Lightly salt the patties. Place in the oven to keep warm while you finish frying the remaining patties. Serve with your favorite condiment.